Camping at the Homestead Murchison House Station is right by the Murchison River, close to ablutions, and beats the alternative any day. No power. BUSH CAMPING out on the station on the north side of the Murchison river is available for people who are 4WD capable and self sufficient. It provides an opportunity to experience true remote wilderness camping and the adventure of discovering this beautiful property. You can find your own special piece of paradise on 350 000 acres of land which is bounded by the ocean, the river and the Kalbarri national park. 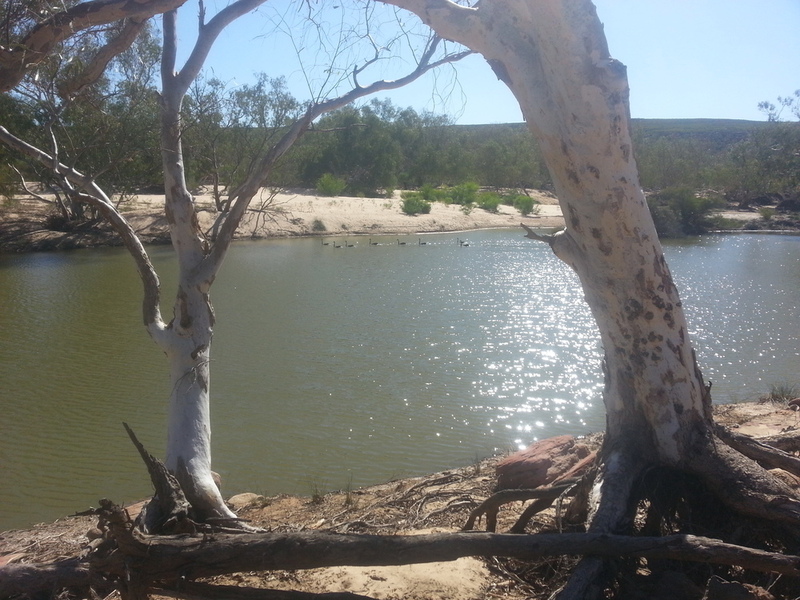 There are simply beautiful bush camping spots in private and picturesque locations. Ideal for some peace and quiet for two, a camping holiday for the extended family, or for groups such as 4WD clubs. On arrival we will provide you with a map, ask you to log in and offer some guidance as to where to go, based on discussion with you about what kind of experience you are looking for. Murchison House Station features some rugged terrain which can be challenging for even the most experienced four wheel driver. You must be completely self sufficient for bush camping and carry water, supplies, first aid equipment and recovery gear. There are no amenities available on the north side of the river. If you are planning to access very remote or rugged areas of Murchison House Station we recommend to travel with two vehicles. Based on expected weather conditions and knowledge about current conditions, we will recommend the safest route and locations. Murchison House is a working cattle and goat station. All tracks have been produced to facilitate station management. Some 4WD experience is required. Please be advised that you will be required to pay recovery fees should we have to assist you with recovery of your vehicle. Minimum call out fee is $250.00. Downstream from the homestead the Murchison River is under the management of the Shire of Northampton and protected as a River Reserve. Therefore, while 4WD access to the river is possible for swimming, fishing, kayaking and other leisure activities, camping right on the river bank is not allowed. There are still plenty of camping options within walking distance of the rivers edge. Wherever you camp, you still have the convenience to leave your camp and drive into Kalbarri to restock, and enjoy the amenities and activities there. And at the end of the day you will be back to your own spot under the stars by your camp fire. Please be advised that CHAINSAWS are not permitted on the station. You are allowed to use small pieces and kindling that is on the ground but no chopping down of tress. You can use a generator if you please but be mindful of other people around you. Generators must not be used between 8pm and 7am. Friendly happy Dogs are permitted on the station. Please leave them in your vehicle until you arrive at your camping destination. Please don't walk your dogs up near the office and Homestead grounds. Please keep them with you and clean up their mess. No chasing of livestock. Motorbikes, Quadbikes and ATV's are not permitted on the station. Flying of UAV's (Drones) are not permitted on the station without owners consent. We restrict the number of vehicles that can access the station for camping so that it is possible for campers to enjoy this unique experience. We suggest you book early for peak periods such as school holidays and long weekends (public holidays) to avoid disappointment. We do not allow access once the quota is reached. A deposit to hold your place will be required. If you would like to look at a more detailed information page please click this link. Thanks so much for having us on the Station, we had a very relaxing stay in Granny’s Camp. Here’s a link to my facebook page where I have posted the shots. Let me know if you aren’t able to access them. Map- $20 deposit (refunded with return of map).